Another little dog — a ferocious French Bulldog named Jules — scared three bears away from her family’s property in Monrovia, Calif., on Oct. 2. Two little terriers — a Jack Russell named Sid and a Yorkie named Benji — are in the news this week for their acts of bravery. Or at least for their acts of barking. The dogs may be small, but their barks were big enough to help prevent bears from harming or killing their owners. At 5 a.m. Sunday, Sid started barking and wouldn’t stop. The 9-year-old Jack Russell Terrier lives in Kimberley, British Columbia, with his pet parents, Nikki and Mark Traverse, and their 13-year-old son. Nikki got up and followed Sid to the kitchen, where she was shocked to see a grizzly bear. The bear had climbed through an open window into the house, and was eating pet food. “I ran back into our bedroom to grab my husband and say, ‘There’s a bear in the house, there’s a bear in the house!’” Nikki told CTV News. Mark grabbed a hunting rifle and entered the kitchen. He shot the grizzly bear when it took a step toward him. “It took another step and I shot it again,” he told CTV News. The bear died on the kitchen floor. Conservation Officer Jared Connatty told CTV News it’s unusual for grizzly bears to break into houses. As it turned out, the 15-year-old grizzly bear in the Traverse’s kitchen was in very poor health, “which is why it’s resorting to these measures to gain its food resource,” Connatty said. From now on, the Traverse family will close all their windows at night. And Sid will probably be getting extra treats. “This is the dog that saved us,” Mark told CTV News, patting the small hero. 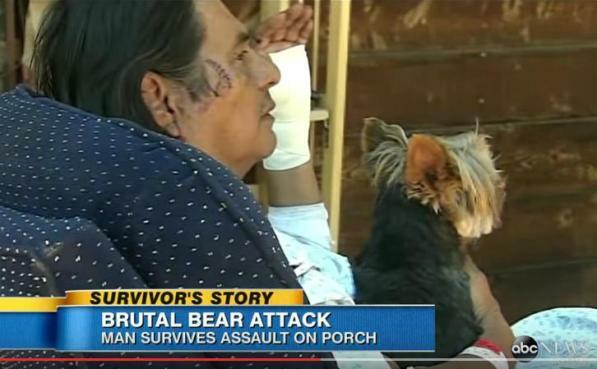 As Larry Yepez stood on the front porch of his Midpines, Calif., home around 4 a.m. Thursday, a 200-pound black bear pounced on him from behind. Yepez, a 66-year-old former Marine, fought back. Joining Yepez in the fight was Benji, his tiny Yorkie, who yapped and nipped at the bear. Yepez said Benji saved his life. He and Benji made it back into the house, but the bear tried to break in. Finally, it wandered away. Although Yepez suffered lacerations and puncture wounds over much of his body, he was able to drive himself to a hospital. He was given rabies and antiobiotics treatments, and was released a few hours later. Benji, who was unharmed, sat in his dog dad’s lap during the KFSN interview. “I know, I know, that was something, huh,” Yepez cooed as his little hero gave him smooches. Lt. Chris Stoots of the California Dept. of Fish and Wildlife told the Associated Press that because of the state’s drought, bears are increasingly roaming into urban areas to forage for food and water. Before the black bear attacked Yepez, it had been eating from trash bags about 20 feet away. If the bear is found, it will probably be killed. Stoots warned people in the area to keep trash secure, be aware of their surroundings, supervise children and pets, and to call 911 should they see a bear.